From the beautiful and pristine Beaches of Guanacaste to the exotic Beaches of the Caribbean to the wild beaches of the South Pacific, Costa Rica surfing is incredible. Wherever you go, there are great waves. Surfing in Costa Rica offers amazing views of clean wild beaches, tropical sunsets and lush rainforests. It doesn’t matter if you’re a novice or an expert surfer. You’ll find waves and breaks for every level and surf lessons and instructors all over the country. Plan your next surfing trip to Costa Rica today! The climate in Costa Rica allows surfing all year long. There are two seasons in Costa Rica, the rainy season and the dry season. The rainy season is from May-November and the dry season is from December-April. The rainy season lasts slightly longer on the Caribbean. Contrarily, it tends to be much shorter and dryer in the Guanacaste Province, along the Pacific Coast. Thanks to Costa Rica’s tropical climate, you can find great surf breaks all year long—you just have to know where to go. You’ll find bigger, more consistent waves during the rainy season. From May to mid-November, there are great swells along the Pacific Coast. (Guanacaste, Central Pacific), especially in June, July, August and September. On the Caribbean side, the swells are amazing, but not as consistent. Your best chance at catching a great swell on the Caribbean coast is from October-April. It can be difficult to choose where exactly you want to spend your surf trip in Costa Rica. Many surfers looking for 7-10 surfing vacations might want to focus on Guanacaste, in the northern part of the country. There are several beaches located very close together and it’s easier to travel between beaches. Playa Hermosa near Jaco Beach, Witches Rock and Playa Grande are all famous surfing beaches in Guanacaste. There are also a variety of surf towns to spend time in. If you’re looking for more of a party scene, check out Playa Tamarindo or Jaco. For a more relaxes surf town, try Santa Teresa. The best surf spots along the Caribbean Coasts are Salsa Brave and Cahuita. The reefs breaks are some of the heaviest in the country. However, they tend to be crowded by territorial locals and tourists. You also need to be aware of sharks and crocodiles near the river mouths. Ask about rocks and marine life before you start surfing on the Caribbean coast. You will find the best surfing in Costa Rica, but you it’s quite a commitment to get there. Playa Pavones has one of the longest left-hand breaks in the world. It’s also 10 hours from San Jose and requires 4-wheel drive and an expert driver. The waves aren’t always consistent. Matapalo is on the northern side of Golfo Dulce. It has good right-hander swells, but is even less consistent than Pavones. About three hours away you’ll find Dominical. It’s a good surfing and tourist spot. Other excellent surfing beaches include Santa Teresa and Malpais in Nicoya, Playa Dominical, Playa Negra, Playa Junquillal, Playa Naranjo and Playa Avellanas. Where ever you travel in Costa Rica, you can find the perfect swell for you. The pristine beaches are unlike anywhere else. Plan your surfing vacation to Costa Rica today! 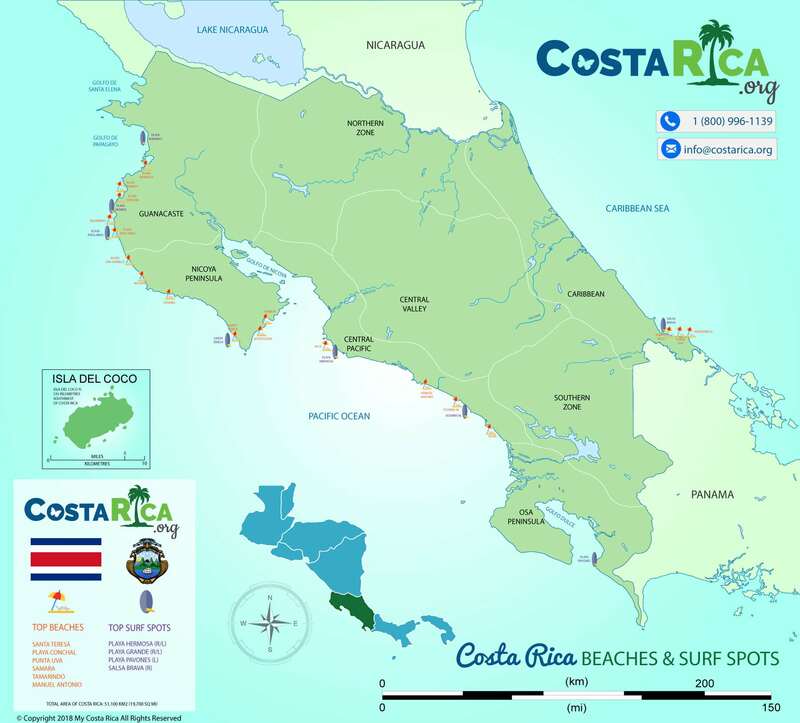 Costa Rica has over 50 famous surf breaks along its gorgeous beaches, some of which are legendary. The waves are huge and offer hollow and fast rides. Some breaks, like in Pavones on the Southern Pacific Coast, offer the longest rides of the world. Getting there by itself is an adventure, it is all worth it in the end! Some of these beaches are hard to reach due to poor roads conditions. Some are reachable by plane, but many domestic flights will not accept surfboards, so plan to rent a car or travel by bus. Hermosa Beach near Jaco (there are many “Playa Hermosas”), is known for its easy access and proximity to Costa Rica’s biggest surf town, Jaco Beach. Hermosa Beach is one of the best places to surf in Costa Rica, with eight kilometers of dark sands and powerful, fast hollows for expert surfers. This beautiful beach was the site of Billabong’s ISA World Surfing Games back in 2009. On the site, Hermosa offers a few quiet beachfront hotels and a couple of stores and restaurants, since the vast amount of Hermosa surfers stay in Jaco hotels. The dark volcanic sands at Hermosa Beach are a Natural Wildlife Reserve for marine turtle nests, which is the reason most of Hermosa seems desolate. So if you see a turtle, leave it alone and don’t take photos of it, especially with flash. Pavones Beach is way down south close to the Panama border on the Pacific side. On a good day, waves can reach exceptional lengths, sometimes as long as half a mile. The waves there are so consistently long, it has been rated as the second longest left in the world. Flying to Pavones is a good option for this World class Costa Rica surf. This part of Costa Rica is remote, and few surfers are willing to make the long drive. However domestic flights don’t usually accept surf boards. If you are going to drive to Pavones, you need a car with 4-wheel drive and somebody who knows where they are going. The trek is difficult, but worth it once you reach the quiet, beautiful surfing haven. Grande Beach, or Playa Grande, is part of Las Baulas Marine National Park, a leatherback turtle (Dermochelys coriacea) conservation area for nesting that happens to produce fast and fun right and left fifty-meter beach breaks with sandy bottoms. The waves are so good here; turtles surf them since the day they hatch. Playa Grande is close to Playa Tamarindo, which is a great town for nightlife. Caribbean Salsa Brava close to Puerto Viejo Beach has public access to epic fast, powerful hollow right reef waves only pros should handle. Even so, this beach attracts a crowd of surfers over the weekend that can be overwhelming. Salsa Brava means Gnarly Sauce because it is considered home to Costa Rica surf’s heaviest wave. Beware of territorial surfers, rocks and marine life when surfing on the Caribbean side. It’s a good idea to talk to locals about when and where you should be surfing.